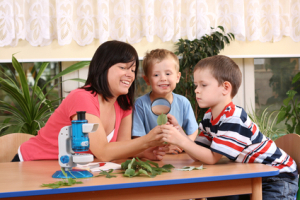 Our Early Childhood Curriculum embraces all aspects of a child’s growth and development. We believe preschoolers possess a natural curiosity of the world around them and are continually seeking out new information. We recognize that no two children are alike. They learn in different ways and at different rates. Our integrated and balanced approach to planning allows us to cater to these individual differences and to foster development in each child. Learning occurs from the moment children arrive at Friends ELC. Each time of day has its own unique characteristics and importance. We value smooth, predictable transitions throughout the day, that foster confidence and facilitate independence. Parent-teacher conferences are held to make sure parents are aware of their child's development and process. Not just meeting but exceeding kindergarten readiness is the goal of the preschool class. Based on feedback from area school districts, we are successful in achieving this goal at Friends ELC. Each day, children are invited to participate in a wide variety of discovery and play based activities that are developmentally appropriate. We believe that through play, children experience the joy of discovery and learning for themselves. Here are typical daily schedules for the children in the Preschool Program: Three Year Old Schedule, Four & Five Year Old Schedule (children entering Kindergarten in the Fall attend break out activities with a more challenging focus). Our teachers plan a wide range of curriculum-based activities to be explored during the day with a focus on promoting kindergarten readiness.